Today is Blog Action Day, and I am joining with nearly 2,000 other blogs around the world to talk about Human Rights. Since this is a book blog, I thought it would be best to talk about human rights from the perspective of a book. At first, I was going to read Infidel by Ayaan Hirsi Ali. It's been on my shelf for a few years now after a friend recommended it. I started reading it, but soon I was drawn to another book that was just published last week. 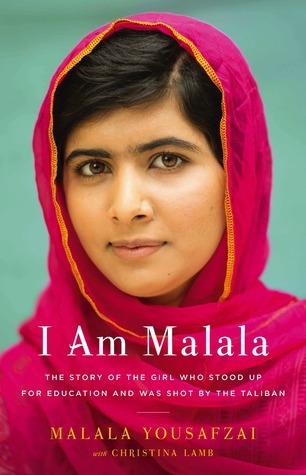 Of course, as the subtitle declares, Malala was eventually shot by the Taliban for speaking out. The soldiers entered the school bus, asked which girl was Malala, and then shot her in the head. She survived and has become even stronger and more powerful than before. She continues her fight for the education of all children ~ boys and girls. I Am Malala is a powerful book about an amazing young woman. The beginning of the book is filled with history lessons ~ about Malala's family as well as Swat and Pakistan. She provides much detail about the rulers of the country and the different rules imparted on citizens under each. I will say there is some repetition at times, and it's a bit hard to keep up with all of the details. The story picks up pace more in the second part. I would highly recommend I Am Malala for adults and teens. Not only will it offer some historical information, but it also provides a glimpse into a very different culture from the perspective of a teenager. And it will show teens that they can have a voice and make a difference even at their young age. Be sure to check out other blogs about Human Rights by visiting the Blog Action Day website or check out #BAD2013 or #humanrights on Twitter. I've been so impressed by the times I've heard Malala speak. I am looking forward to reading her story!